Diamonds are beautiful, brilliant and one of the biggest investments a person may ever make. Diamonds of all shapes and sizes are coveted throughout the world and rank as the most popular gemstone. Diamond owners often have their diamonds longer than their cars, homes, and other material possessions and pass them from generation to generation. The emotions tied to our diamonds are deep and strong, oftentimes representing the bonds of true love and family history. With the emotional and monetary value of diamonds, proper care for them is essential to prevent heartbreak, and to ensure that they always look their best while withstanding the test of time. Every diamond owner should follow some basic rules of jewelry and diamond care, maintenance, cleaning and safety. Strong emotional ties to our diamonds ensure that they are worn with love and worn OFTEN, leading to constant environmental exposure. Proper diamond care dictates that it is equally important to elevate your diamond to its optimal condition both when being worn and when being stored. This includes regular annual check ups with your trusted jewelry professional. Even if it appears that nothing is wrong with your piece, it is important to have it professionally checked for loose settings and other non-‐visible damage. Always have the professional check your pieces in your presence during the annual check up and inform you of any issues. Between checkup, if you notice anything loose on your piece or any visible damage, discontinue wearing it immediately and secure it properly until you are able to see your jewelry professional. While diamonds are very sturdy gemstones, it is necessary to remove them before participating in any kind of rough work such as house cleaning and yard work, as the stone could dislodge from the setting. Keeping your diamonds and jewelry safe from loss and damage is only one of the components of proper diamond care. Keeping your diamonds clean and free of films, dirt, dust, lotions, powders, etc. will enhance the brilliance and appearance of your diamonds. There are several different ways to clean diamonds. Your jewelry professional can clean your diamonds while in your presence, however it is a good idea to employ a home cleaning system as you will want to clean your diamond on a regular basis. Simple ways to clean your diamond require the use of common household products. Three variations involve creating your own cleaning solutions for soaking, followed by soft brushing to remove debris, rinsing and drying. 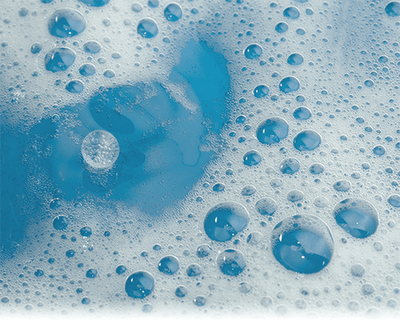 To mix your home solutions you can choose between mild detergents in warm water, cold-­water detergent solutions mixed at a 1 to 4 ratio with water, and ammonia based solutions for an overnight soak. Regardless of the solutions used, you will want to soak the diamond, rub it gently with a soft brush and then rinse (never near a drain). To dry your diamonds after cleaning, you can air dry or utilize a soft, lint free cloth. Other cleaning options include over the counter jewelry cleaners and ultrasonic cleaners. With the store bought options, be sure to follow the manufacturers directions to avoid damage to your diamond. Now that you have clean and well-­‐maintained diamonds, it is important to keep them safe. Some things that you never want to do with your diamond include exposure to chlorine bleach and setting them on the edges of sinks. It is a good idea to remove your pieces as far away from sinks and drains as possible. Also, do not remove your pieces when other people can observe that they are being removed and where they are being stored. Diamond owners should consider safe storage options including home safes and safe deposit boxes for diamonds that are not being worn. There is a wide range of diamond storage cases available and most involve some sort of fabric lining. You can shop around and choose based on size, budget and personal taste. When traveling with your diamonds always keep them safely stored when not being worn. Following this simple diamond advice will allow you to enjoy your diamonds today and well into the future.